The Sport for Hope Centre in Haiti provides young people and local communities with opportunities to practice sports and develop their bodies, minds and wills in the Olympic spirit. It aims to promote sport, education and social development in the surrounding communities and through the country. 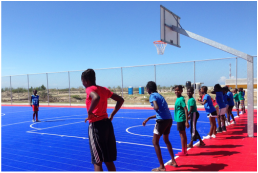 Placing Sport for All at the heart of its approach, the Sport for Hope Centre is committed to promote the development of sport at all levels and create access to sports and physical activities for as many people as possible. The modern multi-functional sports centre provides elite athletes with state-of-the-art training facilities and young people and local communities with positive sport and development opportunities. The Centre, built at a cost of USD 18 million, was a joint initiative between the IOC, its key stakeholders and the Haitian Government. The Centre is now managed by the Sport for Hope Foundation which values its contribution to social change and human development. The Centre also offers an integrative sport-based sociocultural and educational programme for the most underprivileged, out-of-school local children, the Integration Programmes as well as the opportunity for surrounding communities to leverage social and cultural development through events and activities.